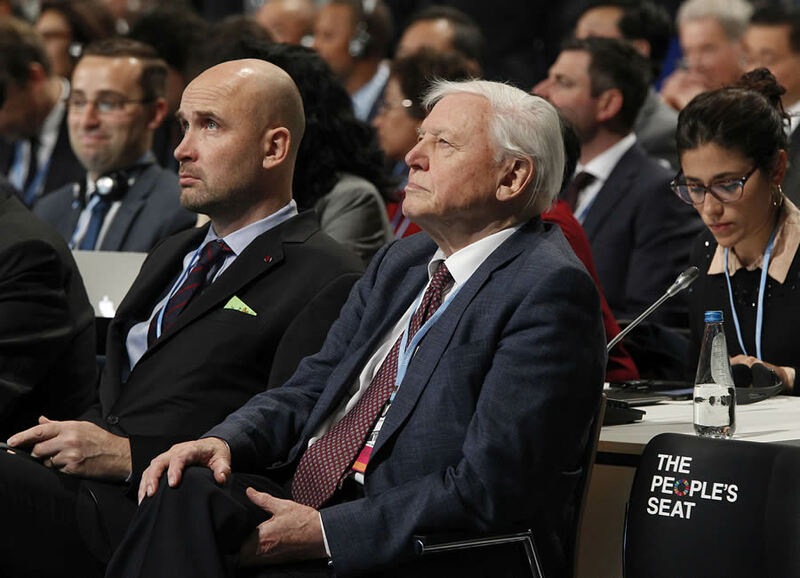 Natural historian Sir David Attenborough, second right, listens to speeches during the opening of COP24 UN Climate Change Conference 2018 in Katowice, Poland, Monday, Dec. 3, 2018. Like my peers in the 1990s, I watched plenty of wildlife shows on TV. David Attenborough, the famous natural historian, was among the most powerful voices. Many nature lovers admire him. He helped kindle my passion for wildlife conservation. After university, I worked on many assignments to conserve species around the world. Never would I have guessed that Attenborough would undermine science. But he does. How? He says civilization is near collapse. And he wrongly blames man-made global warming. I spent 8 years as an academic in climate science. I understand the diversity of opinion. I can say without doubt that Attenborough is wrong. Earlier this year, he claimed that global warming is turning our landscapes into “plantless deserts.” He couldn’t be more wrong. Global warming doesn’t threaten civilization. Hundreds of articles in science journals document the Roman Warm Period (1st century) and Medieval Warm Period (10th century). In both, global temperature was remarkably similar to today’s — and people thrived. These two warm phases occurred without significant human emissions of carbon dioxide. Clearly, then, humans did not cause them. Attenborough should join other climate alarmists and admit the bankruptcy of climate doomsaying. Michael Mann, a staunch alarmist, admitted the lack of warming in recent decades. He exposed faulty forecasts from computer climate models that guide global temperature forecasts. For the past 18 years, global temperature has failed to rise significantly. At the same time, carbon dioxide emissions have surged. More disappointing to me, Attenborough claims that global warming is making the earth a “plantless desert.” He ought to tell his listeners about the Little Ice Age. In the 16th century, it crippled agriculture and caused disruption globally. In the last two centuries, warmer temperatures and increased atmospheric carbon dioxide have boosted plant growth immensely. They have boosted modern agriculture. They enable us to meet expanding food demands. Warming prolongs growing seasons. It expands plant ranges into higher latitudes and altitudes. And it brings more rainfall. All of these green the planet. With more carbon dioxide, plants grow better. They grow better in warmer and cooler temperatures. They thrive in wetter and drier soils. They make better use of soil nutrients. They resist diseases and pests better. They expand their ranges, greening more of the planet. They improve their fruit-to-fiber ratio. All of this means more food, especially for the poor. But Attenborough ignores these facts. Why? Because they threaten his alarmist narrative. Once an admired voice on television, Attenborough now undermines climate science. He leads millions into believing the false alarm of climate doomsday.